SgurrEnergy is a leading independent engineering consultancy specialising in worldwide renewable energy projects. SgurrEnergy has the capability to deliver at every phase of a project, from the early stages of site selection, feasibility and design right through to project management of the construction phase and operation and maintenance. SgurrEnergy’s multi-disciplinary consultants have extensive sustainable energy experience worldwide. To date SgurrEnergy has assessed over 85,000MW of renewable energy developments internationally and this figure is growing rapidly every month. SgurrEnergy’s clients include utilities, financiers, developers and many other public and private sector organisations. SgurrEnergy is the lead partner for the Wind Energy Preparation Programme (WEPP), as part of the larger Malawi Renewable Energy Acceleration Programme (M-REAP). The MREAP program is being led by the University of Strathclyde and is funded by the Scottish Government. The project is being led by the University of Strathclyde with UK partners: SgurrEnergy, IOD Parc and Community Energy Scotland. Partners in Malawi include the Government of Malawi (GoM), Department of Energy Affairs (DoEA), University of Malawi Polytechnic, Mzuzu University, Concern Universal, Mulanje Renewable Energy Agency, Opportunity International Bank Malawi and Energy Technology Partnership. This programme has been established to accelerate the adoption of renewable energy technologies, on a domestic and commercial scale, in Malawi, with a particular focus on the alleviation of poverty. The WEPP programme itself will encompass initial feasibility studies for a number of small wind farm sites, including anemometry mast installation and data collection on the preferred sites. The production of a full feasibility study and energy yield analysis for each site will conclude the project. This will allow the wind farms to progress through to the final development and financing stages, and on to construction and operation, with a low level of risk, ensuring maximum benefits to the local communities and Malawi as a whole. As part of the initial feasibility studies SgurrEnergy utilised the ARCHIE-WeSt HPC facility to run a Weather Research and Forecasting (WRF) mesoscale wind resource model of Malawi (Fig. 1). Running a WRF mesoscale wind resource model over such a large area is very computationally intensive and as such the use of a dedicated HPC facility allowed the model to be set-up, tested and run in a timely fashion. 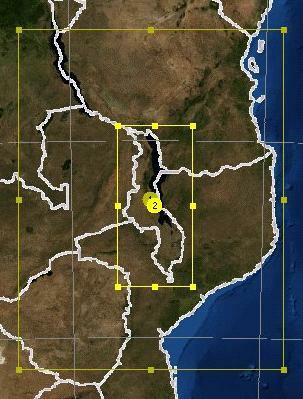 The outputs of the wind resource model were used to identify areas within Malawi with a promising wind resource. They will also be used on an ongoing basis to inform various elements of the detailed feasibility studies. Figure 1. Nested WRF Domain Centred Over Malawi.